Edward John “Ted” Feeman d 1899 Eng Louisa Bell b 1796 Wiltshire, Eng. b 1889, Middlesex Co, Eng b abt 1838 Wiltshire, Eng. Jane ? d 1961 Canada b 1798 Wiltshire, Eng. Amelia Sophia Collins b 1795 London, Eng. Elizabeth ? Ethel Freeman Johnson (daughter of “Ted”) once said that the Freemans were French Huguenots who were kicked out of France, and that they went to Jersey Isle. (Might have been another of the Channel Islands. Many Huguenots first went to one of the channel islands before moving on to Ireland or England.) Also have reports that they were from the Isle of Wight or the Isle of Man, but have not been able to substantiate any of this. The Freeman line here is from London and before that they were in Chipping Norton, Oxfordshire, England at least by 1765. 1. Samuel Freeman, born about 1715, probably Chipping Norton, Oxfordshire, England. It’s uncertain who his parents were. His brothers were Edward & Joseph Freeman. Edward was a barber and periwig maker and mentioned in his will his brothers Samuel & Joseph and his nephew Edward. 2. Edward Freeman, born about 1740, Chipping Norton. Named for his uncle. Edward married Alice Parker, Feb 16, 1767, Chipping Norton. Alice had been a servant girl in his uncle Edward’s house. 3. Samuel Edward Freeman I, christened March 25, 1771, Chipping Norton. Married Elizabeth Cooper, May 4, 1802, St. Mildred's Bread St, London. He died in May or Aug. 1814 (age 43) and was buried at St. Mildred Bread Street Church (cemetery now demolished). Children: Elizabeth Alice (1804), Harriet (1805), Samuel Edward (1806), John (1808), Elizabeth (1809), Cooper S. (1811), Mary (1813). 4. Samuel Edward Freeman II, born March 18, 1806, London. Baptized Apr 13, 1806 at St. Margaret Moses Church, Little Friday St., London. He married Eliza Adams Randall, Sept 11, 1827 at St. James Clerkenwell, Islington, Middlesex Co, London. Witnesses to their wedding were: William Randall [her father], Harriet Freeman [his sister], and Ethelfleda Randall. They moved often as their children were born in several place around north and east London. He was a policeman in London by 1840 and in the 1851 census he had the rank of police inspector. In 1851 his mother, Elizabeth (76) was living with them. In 1852 he led a group of 50 experienced policemen to Melbourne, Australia where he became superintendent of the police in May 1853. Australia had law and order problems stemming from the 160,000 convicts brought there. When gold was discovered in May 1851 a whole new problem arose for the police. In Nov., 1852 50 policemen resigned. The government had difficulty getting local recruits, so they petitioned England for help. In Dec, 1952 50 London policemen, called the “London 50” took the challenge to restore law and order in Melbourne. They received a six month advance of 34 pounds. They sailed on the ship “Earl Gray” in early 1853, but by the Fall many of them had resigned or went AWOL (couldn’t be found). The work was hard and dangerous for men who were used to walking a beat with a stick. Only 14 stayed with the force. Their senior officer was Inspector Samuel Edward Freeman. See this link for an 1860 picture of the police force. After a few years in this position the city council removed Samuel as the police chief and placed him in a smaller municipality. He felt demoted and humiliated and soon committed suicide in 1862. His wife sued the city for damages. In the court deposition the council claimed that they made the move because of his health and were only trying to do what was right for him (not sure if that defense worked). See link for a memorial to him. Eliza died in March 1882 in Australia, buried Melbourne Gen. Cem (same as her husband). When Samuel moved to Australia records say he took 5 children in Australia and left behind 2 children in England (son, Samuel Edward III was 24 when his father left, and daug. Lydia had died as a child). 5. Samuel Edward Freeman III, born Nov 4, 1828; christened Dec 1, 1828, St. James, Westminster, London. He did not move to Australia with his father in 1853, though all of his siblings went there. He was a tailor's cutter and pattern maker of Islington. He married 1st to Louisa Bell in July 1, 1855 at St. Mary Whitechapel (daughter of William & Jane Bell). In 1861 the Freeman family was living a couple of kilometers west in Shoreditch (NE part of Greater London). In 1861 the Doyle family was also living in Shoreditch, London, and since Edward Henry Freeman and Mary Doyle married about 1881, it seems likely that their families would have lived in the same area. Shoreditch is located right beside Haggerston Park (listed as the birthplace of 2 of Edward Henry's daughters and one of Michael Doyle's daughters in the 1891 census). Children: Edward Henry (b1856 Mile End, London), Amelia (b1866 Stepney, London). Died Jan-Mar, 1900 in Hackney, age 69. 6. Edward Henry Freeman, born Jan 15, 1856, Mile End (New Town), Greater London. Baptized Feb 24, 1856, Bethnal Green St. Bartholomew. About 1880 Edward Henry married Mary Doyle (daughter of Michael Augustine Doyle and Amelia Sophia Collins. He died in Oct 1899 in Hackney, London. 2 daughters (Mary Amelia/Matilda? and Florence) moved to Australia. Daughter Ethel stayed in England in Liverpool. In 1889 Edward and Mary were living on New Comen Road in Wanstead, Leyton, Essex County. Freeman, Edward Henry (head) - 38, b Mile End, London, Wanstead, abt 1853. Freeman, Edward (son) - 1, b Leytonstone, Essex, Eng. 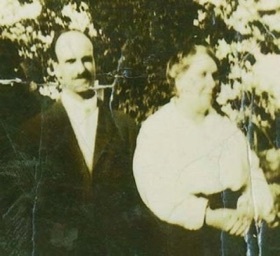 Mary visited her son, Ted in Canada once, sometime after 1914 when he married. Her daughter-in-law, Maud didn’t like her very much, so she never visited again. Unsure when she died, but it was at least after 1914. 4. Ethel Freeman, born 1897; born in England; married Alf Mustart. Lived in England. Ethel's home address in England was: SYA Burnham Road, Leigh-on-Sea SS9 2JR, Essex, England. I can find no record of a Matilda in the census records, just family stories that sisters of Ted (Florence & Matilda) went to Australia. I wonder if Matilda isn’t Mary Amelia? Above: Edward Henry Freeman and his wife, Mary (Doyle).